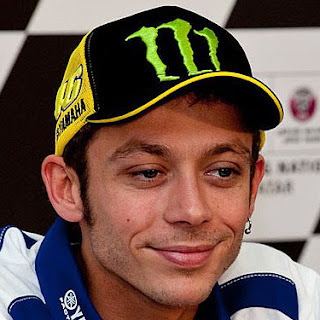 Yamaha will continue its relationship with nine-time World Champion Valentino Rossi. It is with great pleasure that Yamaha Motor Co., Ltd. confirms that Valentino Rossi will remain a part of the Movistar Yamaha MotoGP team‘s rider line-up for the MotoGP World Championship season of 2017 and 2018. Rossi: "I am very happy to announce that Yamaha and I have extended our contract and will continue working together in MotoGP for the next two years. I am very satisfied with this decision, because it has always been my plan to compete in motorsports for as long as I can be competitive and find it enjoyable at the same time. Ever since I returned to Yamaha in 2013 I have felt like I am home again and this showed in the results. I get great enjoyment out of working with my crew and the rest of the Movistar Yamaha MotoGP team. Their support for me has known no limit and I want to thank them sincerely for that. I‘m feeling greatly motivated to keep riding my YZR-M1 for the best results possible, this year and the following two seasons. 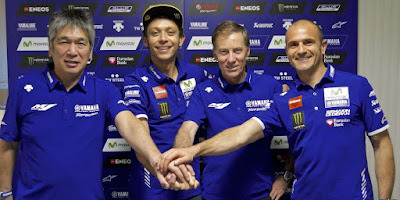 Lin Jarvis: "I believe the confirmation of the extension with Valentino will be music to the ears of Yamaha fans and MotoGP fans around the world. I cannot think of a better way to start a new season than for both parties to make this strong commitment. From Vale‘s side a statement of commitment to the sport he loves and towards the Yamaha brand; from Yamaha‘s side a confirmation of the recognition to the rider that has brought us 4 MotoGP world titles and who remains so passionate about his sport and is still highly competitive, as proven by his two 2nd positions in the last two seasons. "When Vale returned home in 2013 it was “a decision for life”. 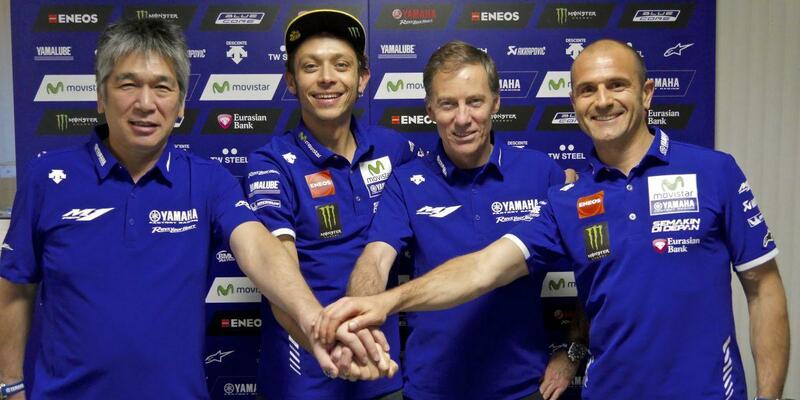 This new Agreement confirms that Vale will indeed finish his motorcycle racing career with Yamaha. Before that however all Yamaha fans can enjoy three full seasons of exciting performances from “the Doctor” as he challenges to win his 10th World Title for the Movistar Yamaha MotoGP team”. I am very happy to announce that Yamaha and I have extended our contract and will continue working together in MotoGP for the next two years.